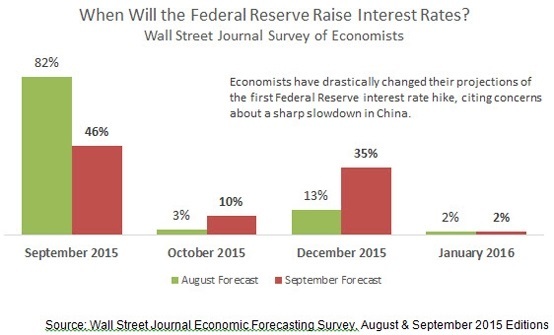 September 14, 2015 - Will Interest Rates Go Up for the First Time in Nearly a Decade? Stocks rebounded during the holiday-shortened week as gains in overseas stock markets spurred buying activity, giving the Dow its best week since March. Despite the buying pressure, investors curbed their enthusiasm ahead of the Federal Reserve meeting next week. For the week, the S&P 500 gained 2.07%, the Dow grew 2.05%, and the NASDAQ gained 2.96%. Fresh data out of China showed that factory output missed expectations, supporting the view that China's economic growth may dip below 7% for the first time since the global recession. Infrastructure investment also fell, leading many experts to believe that China's central government may be forced to roll out new measures to boost economic growth. This week, the eyes of the world will be on the Federal Reserve as the Open Market Committee votes on whether to raise interest rates for the first time in nearly a decade. The FOMC meets Wednesday and Thursday and will issue their official statement Thursday afternoon. The most recent Wall Street Journal survey of private economists shows that experts are split. Last month, a whopping 82% of economists thought that the Fed would pull the trigger this week; now, just 46% think the Fed will act this month. There are strong arguments to make on both sides of the issues. On the pro-rate-hike side are the opinions that too much easy money may fuel asset bubbles. Near-zero-rates also leave the Fed without ammunition in the event of another downturn. On the hold-rates-steady side is the opinion that recent market volatility and ongoing concerns about global economic growth could spark another spate of selling if the Fed moves to raise rates now. Realistically, if the Fed moves this week to raise rates, they will likely announce a quarter-point raise to target interest rates in the 0.25%-0.50% range. How will markets react to a rate decision? It's hard to say. Investors might view an increase as a vote of confidence in the economy and rally. Alternately, sentiment might sour on fears of a new economic downturn. As always, we're keeping an eye on the situation and will update you as necessary. Jobless claims drop by 6,000. The number of Americans filing new claims for unemployment benefits fell last week in the latest sign of health in the labor market. Though weekly claims are notoriously volatile, they have held at historic lows for months now. Consumer sentiment falls to one-year low. A gauge of Americans' opinions about the economy fell to the lowest level since last September. Americans are concerned about both current and future conditions. Import-export prices plummet. The prices of U.S. imports fell by the largest amount in seven months as falling gasoline prices and a strong dollar chipped away at import costs. Export prices also fell, possibly because of weaker global demand. Job openings hit new record high. July job openings hit a new record high of 5.29 million. The rate of voluntary job separations ('quits'), held steady, indicating that Americans feel confident enough to leave their jobs in search of greener pastures.